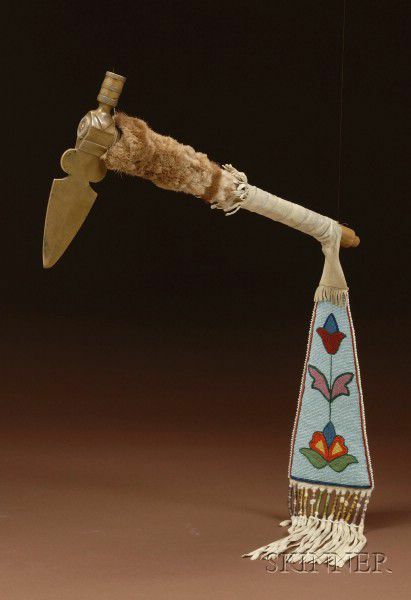 Northern Plains Tomahawk and Beaded Hide Drop, Crow, c. last quarter 19th century, with ash handle pierced for smoking, a variant spontoon-style brass head, the handle wrapped with otter (?) 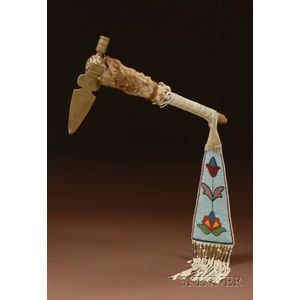 skin at the top and with hide-wrapped lower handle and beaded fringed drop (probably a later attachment), beaded in the Crow tradition with multicolored floral devices on a light blue background, tomahawk lg. 18 1/2, blade lg. 9 3/4 in. Provenance: Collected on the Crow reservation from Elizabeth Smart Enemy. Purported to be the tomahawk of "Bull Don't Fall Down" (1854-1936) who was with the Crow contingent of scouts with General George Crook at the Battle of the Rosebud. "Bull Don't Fall Down" laid claim to stripping off the headdress of Jack Red Cloud during the battle.